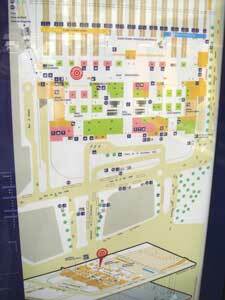 This is a photo guide & map of Gare de l’Est (a.k.a. Paris Est) train station in Paris. Gare de l’Est serves high speed trains such as Thalys, TGV, and ICE (see Rail Europe for tickets) to eastern cities such as Strasbourg, Stuttgart, Luxembourg, and Cologne and also regular speed trains to cities around the Ile-de-France region. Here is a picture of the front entrance of Gare de l’Est, also known as Paris East station, found on street 8 Mai 1945. (See Gare de l’Est in relation to Gare du Nord on Google Maps). This photo was taken looking north. The street running up the left side of the station is rue d’Alsace. 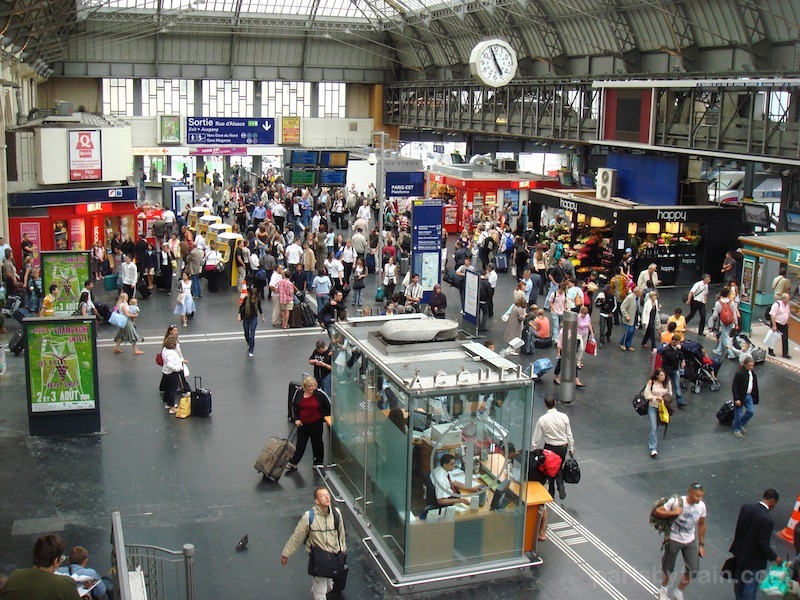 To walk from Gare de l’Est to Gare du Nord, simply head north up rue d’Alsace, turn left onto Rue de Dunkerque and you’ll arrive at the front entrance of Gare du Nord in about 10 minutes. Here is a photo of arriving at Gare de l’Est by way of Metro Line 4, one of three Metro lines with stops at this major train station. Metro Line 5 and 7 also stop at Gare de l’Est. 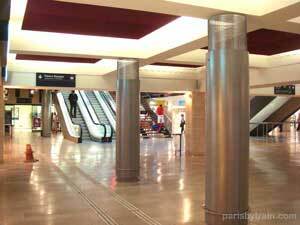 Immediately after entering the station from the Metro Line 4 we are underneath Hall Central. Overhead we see two video screens showing departures information. 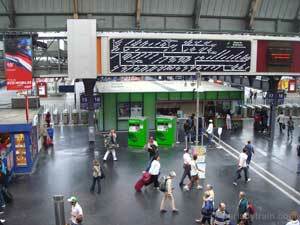 The left video screen, labeled “Départs Grandes Lignes” shows trains leaving Paris for far eastern France and German cities via highspeed trains such as TGV and conventional trains such as Corail. 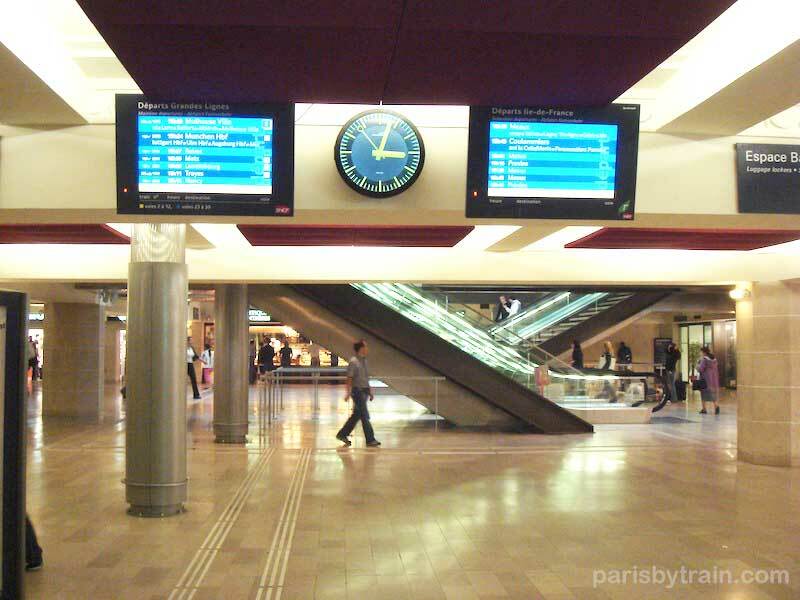 The display on the right shows trains departing for the region surrounding Paris (the Ile-de-France) normally served by Ter and Transilien trains. These trains will leave via the center train lanes (“voie” 13 to 22) reserved for Ile-de-France travel. More on this further down. Another photo of the main Metro entrance/exit underneath Hall Central. Visible are entrance/exits for Metro Line 7 and 4. On the right hand side, partially hidden by some pillars, we can see a ticket window (guichet pronounced [gee-shay]) for purchasing Metro tickets. 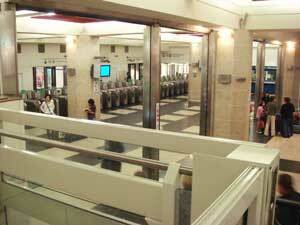 In the immediate foreground of this photo is a is a wheelchair lift down onto the Metro level. 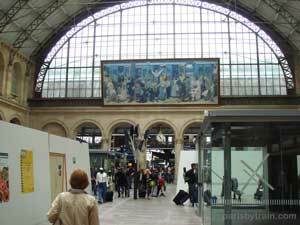 Gare de l’Est is one of the more wheelchair friendly train stations in Paris. 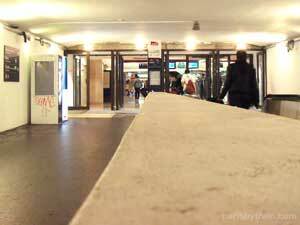 Here’s another photo of the Metro entrance under Gare de l’Est. A sign off to the right shows Metro Lines 4, 5 and 7. On the Metro level is a baggage locker/left luggage room tucked into a corner behind some escalators. 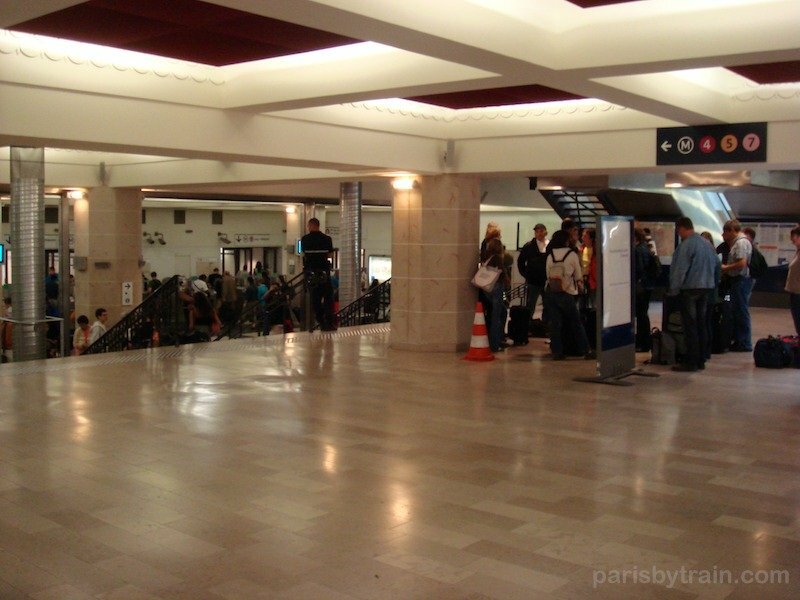 Baggage storage at Paris train stations ranges from 5€ for small lockers to 9,50€ for large ones fitting about 2 large roller suitcases. Maximum duration of storage is 48 hours. You’ll need to pass through a quick security checkpoint in order to store your bags, not unlike the security done for boarding a plane. 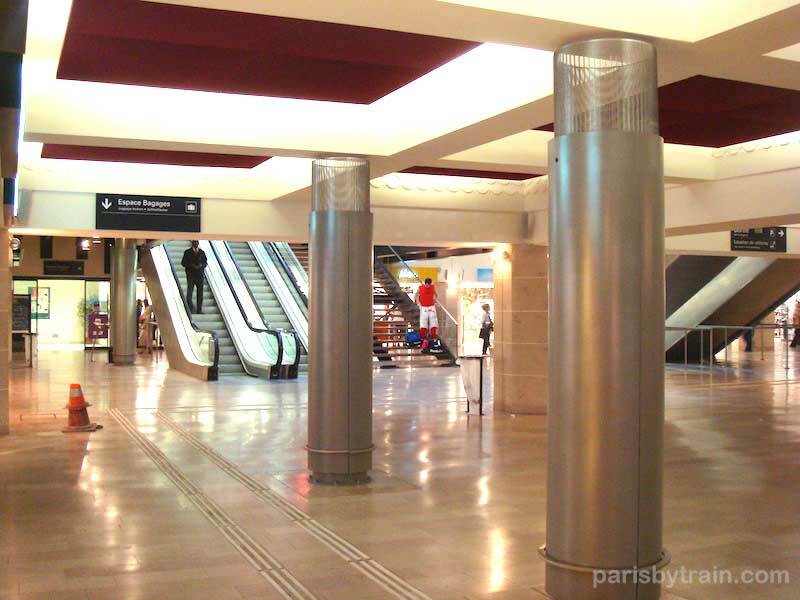 Moving up one level from the Metro lines we arrive at Hall Central of Gare de l’Est. This space is mostly occupied by shops and could be mistaken for a commercial shopping centre. Here’s a wide-angle photo of Hall Central at Gare de l’Est which gives you a good idea of the layout. The information pillar on the left gives you some orientation hints. This photo was taken facing west. Off to the right are the main train lines. The hall beyond the far end of this area is known as Hall d’Alsace. Behind us is Hall St. Martin. This sign within Hall Central shows how the main train lines are split onto two platforms, yellow and blue, with train lanes numbered from 2 to 30. You’ll notice there’s a big gap in lane numbers, 13 to 22. That’s because the central train lanes are reserved for Ile-de-France trains serving the area immediately surrounding Paris. Ticket purchases for trains heading to other cities and far off destinations can be found in Hall St. Martin. Looking just slight down from the previous photo we can see the central train lines off in the next hall. Just before that are a set of four display screens providing information on trains departing within the next hour and from which lanes/platforms. 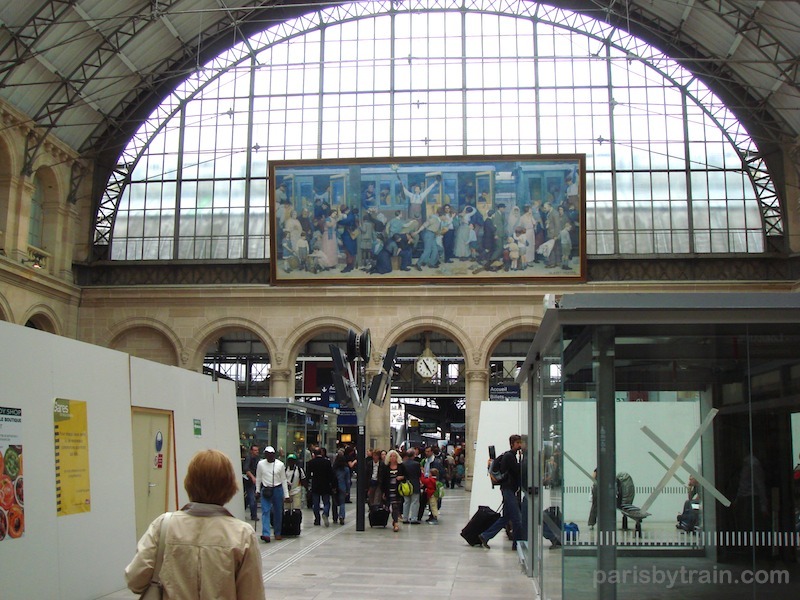 Moving west from Hall Central puts us at Hall Alsace, easy to recognize with its massive overhead painting. Hall Alsace gives access to the yellow train platforms, lanes numbered 2 to 12. This is an overhead shot of the yellow train platform area just north of Hall Alsace. The trains are a bit hidden off to the right hand side of the photo behind the “happy” flower shop. 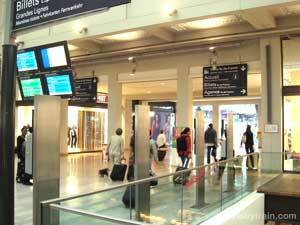 The exit straight ahead leads out to Rue d’Alsace, which as mentioned above connects to Rue de Dunkerque and Gare du Nord train station. Center foreground in the photo is an information booth with an ACCUEIL sign on top, helping passengers out with directions and train information. 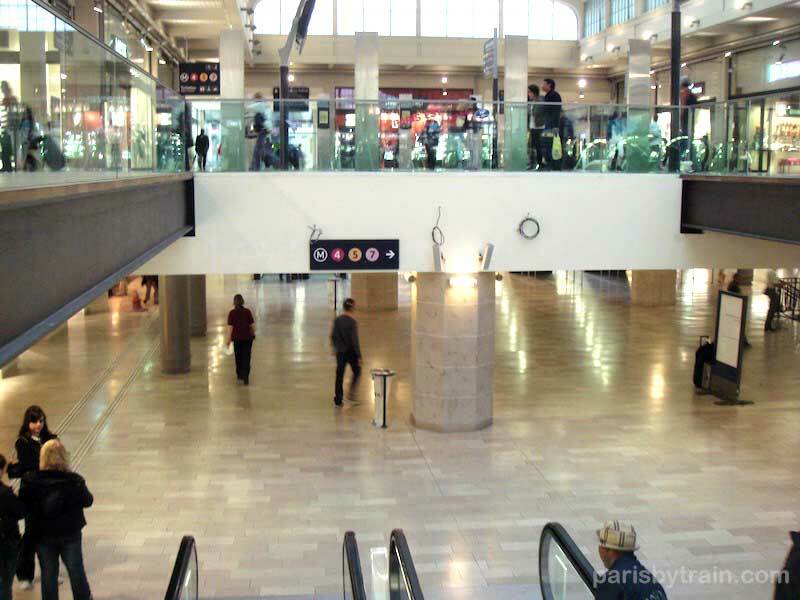 Turning to our right we now face the central train platforms serving Paris and the immediate surrounding area (Ile-de-France). Trains here are sectioned off from the rest of the platform via gate barriers (visible on the left with green lights and swinging glass doors. 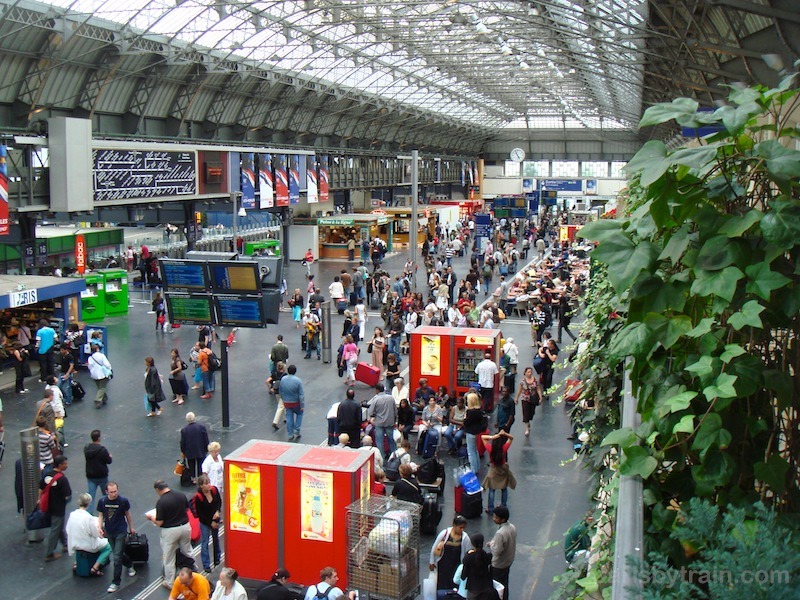 The green building in the centre of the photo sells tickets for Ter and Transilien trains servicing the Ile-de-France region. 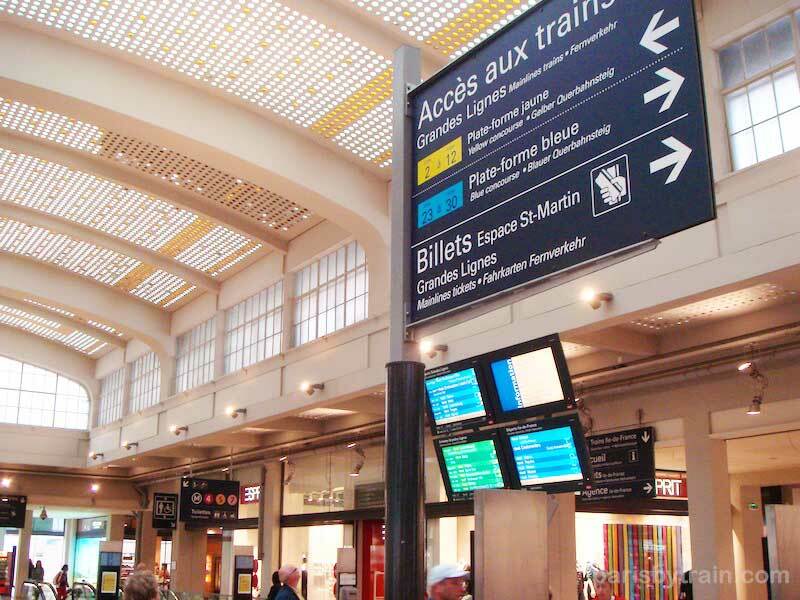 This tickets are known as Billet Ile-de-France and are the same size and shape as small Metro tickets, but are priced specifically for travel between two stations. Two green ticket vending machines are visible in front of the ticket office, which accepts either Euro coins or smart-chip credit cards for payment. 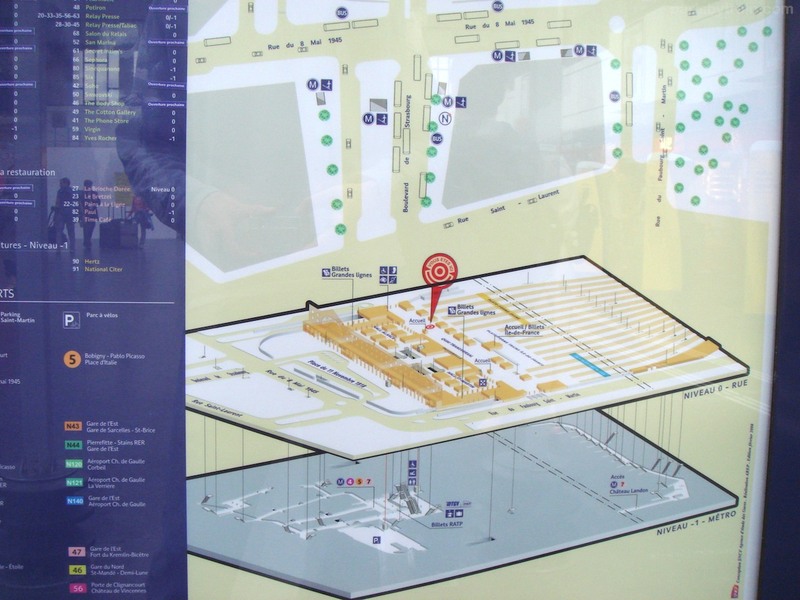 Above the ticket office is an Ile-de-France train network map. Turning again to our right we now face east towards the blue train platform, lanes numbered 23 to 30, with the central platform visible to the left. Here’s an overhead map view of the station showing the yellow platform on the western end, Ile-de-France train lanes in center, and blue platform trains on the eastern end. 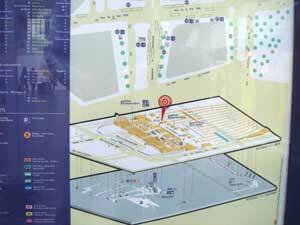 You can also see the layout of Hall Alsace, Central & St. Martin. And finally a closer picture of the two levels of Gare de l’Est showing the place of the Metro lines in relation to the train lines and streets surrounding the station. 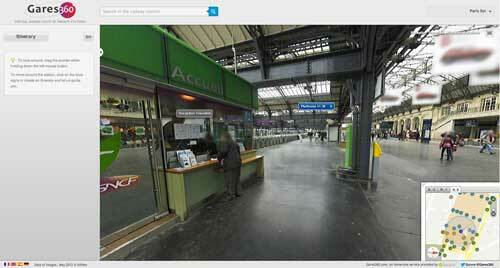 Gares360.com has produced a virtual photo tour of Gare de l’Est. Select the vantage point and the level you’re interested in seeing at the bottom right hand corner of the screen. Click & drag the photo in the direction you’d like to see. I hope this gives you an idea of the layout of Gare de l’Est! Happy travels.